As the new Conference Director on Lay Servant Ministries, Anna Rohde is explaining the role of a Certified Lay Minister and developing a standard procedure for training and tracking opportunities to serve in a variety of ways. In recent months, Dr. Jesse Brannen, Conference Director of the Center for Congregational Excellence, has been redesigning the infrastructure to strengthen efforts related to Lay Development and asked Anna to serve as the coordinator since she has been involved in helping over 60 individuals in north Texas become CLMs over the last seven years. Anna has been in the Methodist church for 30 years and at the District Office for 15 years. 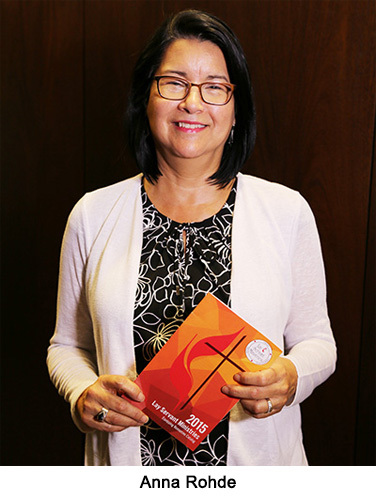 She is passionate about continuing education, and has been an active member of the Professional Association of UM Church Secretaries and Staff for almost 15 years, including becoming UMC certified in 2003. Anna explains that the first step towards Certified Lay Ministry is to complete the Lay Servant Training, Advanced Class. Certified Lay Servant is the first level of service available, and Certified Lay Minister is the next level, involving certain requirements, recommendations, more training and steps. What is a Certified Lay Minister? Anna explains that, “CLMs use their education to fill a pulpit – and much more!” For example, one CLM in Tyler completed the entire process so that he could be more effective at his job as church administrator to a large congregation. The CLM classes gave him a better understanding of the mission and workings of the United Methodist Church,” shares Anna. “And, Ms. Lou Ellen Brown of Hughes Springs FUMC completed her certification classes and thought outside of the box about how to be of service. Mrs. Brown’s husband’s health limits her time away from home so she saw this opportunity as a way to reach others for Christ. She requested to volunteer at the local funeral home to visit and minister to families without a church affiliation, possibly even helping conduct a funeral – which is just one of many avenues for CLMs to pursue. Additionally, Wesley Foundations, homeless ministries, child development centers, parish nurse programs, new church starts, food pantries, youth programs, Bible studies and more all need assistance and offer opportunities to share the Good News. “The need for CLMs is growing, so I am working with several others to standardize the training cross the conference” adds Anna. She is researching 3-4 locations to offer module trainings twice a year that will be more accessible across the conference. “The good news is that the modules can be taken independently, not in a certain order, and that the initial level of training (Lay Servant Training) will continued to be offered in the districts for ease of completion.” She is excited to help centralize the CLM training to insure consistency in education and achieve accurate record tracking for the entire the conference.